In Season of Prophecy, the forces of Sanctuary emerge from behind their walls to take the fight to their enemies. 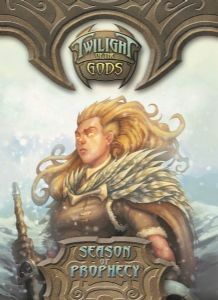 Led by the Norse goddess Freya, these new cards accelerate Sanctuary's early game options and allow for a more proactive and aggressive play style. Not everything is good news for the defenders, however, as the other three factions are mustering potent new additions to their arsenals as well. Season of Prophecy contains 50 cards, which are made up of 16 brand new cards (each having multiple copies), and 4 cards previously seen in the core set.